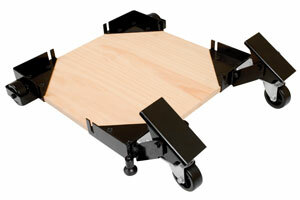 Customize the Universal Mobile Base to fit any size machine with your own cut-to-size plywood. The unit has sturdy corner brackets that attach to 3/4” plywood with through bolts for exceptional strength. 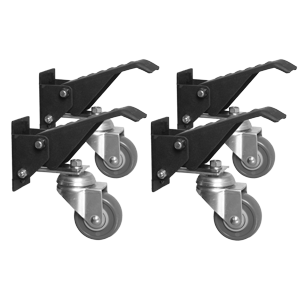 Two swivel casters with built-in kick stands and two fixed casters are included for easy machine mobility. Adjustable feet provide stability during stationary machine use. The unit has a total weight capacity of 600 pounds. 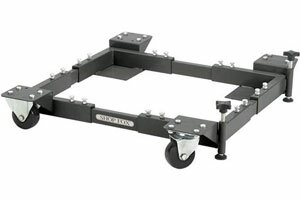 Shop Fox D2057 Adjustable Heavy-duty Mobile Base is patented and is the most stable on the market with outrigger type supports. Adjusts from 19 by 20-1/2-Inch to 29-1/2 by 29-1/2-Inch. 700-Pound Capacity. 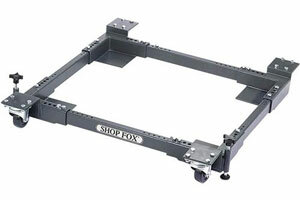 Super Heavy-Duty Shop Fox Mobile Base is the strongest mobile base on the market. Made for machines that weigh between 500 lbs. 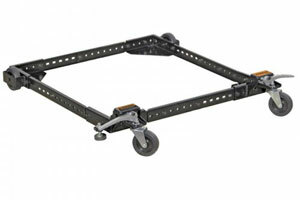 to 1200 lbs., this base is extremely stable with outrigger type supports. Adjusts from 18 by 24-1/2-Inch to 28-1/2 by 33-1/2-Inch. 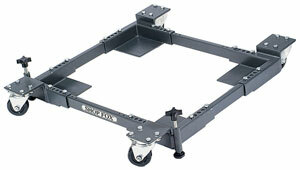 Extention Bars (#3998 sold Seperatly) Increases maximum size capacity of D2058 Mobile Base to 33-1/2" by 44". Shop Fox® Heavy Duty Mobile Bases are designed to give you a stable and mobile platform upon which to mount machinery and equipment having a variety of base sizes and weights. The heavy-duty casters are arranged on outriggers allowing the machine to sit as low as possible and yet be extremely stable. Swivel casters on two corners provide excellent maneuverability. 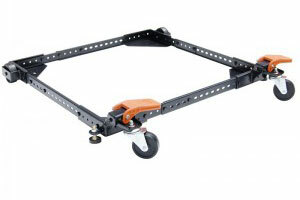 The bolt pattern on the fixed caster side allows orientation of the wheels in either of two directions. The base can be assembled in any of eight configurations providing maximum flexibility of use. The unique two piece retractable feet use rare earth magnets to allow the knob to turn while the foot pad is tight to the floor. You will find these mobile bases to be far superior to any mobile base on the market in strength, adjustability and movability. This patented mobile base is the most stable on the market with outrigger type supports. Adjusts from 10-1/2" x 14-1/2" to 17-1/2" x 21-1/2". 600 lb. Capacity. Weighs 30 lbs. With HTC PortaMate PM1000 Universal Mobile Base, size is no longer an issue. Each base features side rails and corner pieces with holes spaced every 1 inch to insure the perfect fit for your machine. Move bandsaws, table saws, sanders, drill presses, jointers, planers, and much more. Handles machines up to 400 pounds. Each side expands from 14" x 43"
Maximum Square 31" x 31" Maximum Rectangle 19" x 43"
With the HTC2000 adjustable mobile base, it's never been easier to move equipment around a crowded shop. This fully adjustable mobile base features side rails and corner pieces with holes spaced every inch to insure the perfect fit for your machine. Move bandsaws, table saws, sanders, drill presses, jointers, planers, and much more. You'll be able to open up space for more effective productivity, better organization and safety, and added convenience during cleanup. The base is sturdy and easy to assemble, plus it adjusts to fit virtually any large woodworking machine, forming squares from 12 by 12 inches to 36 by 36 inches and rectangles as big as 20 by 52 inches. Holes at 1-inch increments let you choose any shape in between, and 3-inch diameter wheels at all four corners make it easy to maneuver. Roll one tool in; roll another tool out. The large, industrial-grade foot-operated levers lock machines to the floor, and their increased lever length makes moving heavier machines a breeze. The base also features a durable powder-coated finish. The HTC-2000 has a maximum weight capacity of 500 pounds. All parts are included, and it's backed by a manufacture limited lifetime warranty. Slotted side rails allow for an exact machine fit and raise machine height by just 1"
Adjustable in 1" increments to fit most machines using side rails; expands from 12" x 12" inches to 36" x 36" inch or up to 20" x 52"
Low profile, increases machine height by less than 1"
Move your workbench to any area in your shop with our 360° workbench casters. This set of 4 casters work by simply pushing down on the pedals to raise your workbench off the floor. Once elevated you can move your bench as desired, then lift up on the pedals to disengage and your workbench sits firmly on the floor. Each lift pedal is textured to provide extra grip. The 2-3/8” urethane casters are rated for 100 lbs of capacity, which means all four together give you a total weight capacity of 400 lbs. 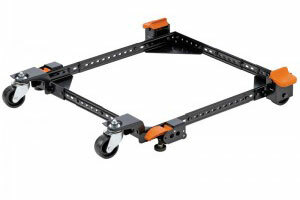 The Workbench Caster 4 Pack includes all of the mounting screws necessary for easy installation.